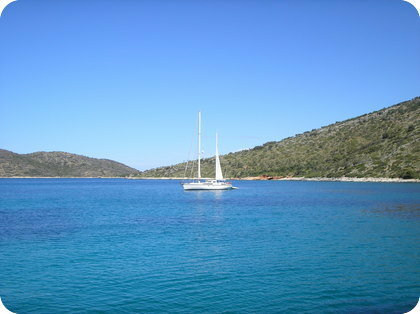 Nisos Yioura was the most north-eastern island of the Northern Sporades that we did. What more do you need to have a look? 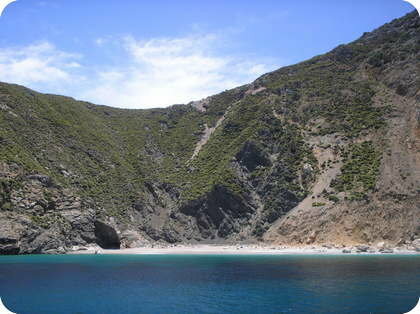 As with the other Sporades islands, this one is very mountaineous and very rough. The geologic lines in the rocks are amazing. 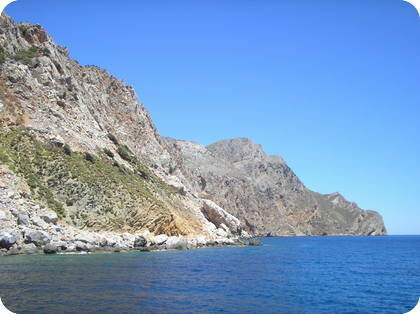 Looking on the chart, you'll see there are very few places to anchor, but in the north-east of Nisos Yioura, there's a large patch of suitable anchor depth. And... this is where the white beach will astonish you. 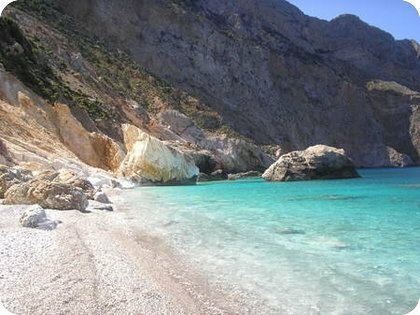 The colour is bright, the beach is full of white polished pebbles, the view is magnificent!! Perfectly clear water, steep mountains, nobody around...how special is that! Leaving the beach behind, we motored further around the island, counterclockwise. On the western side, we saw the European wild goat, the very rare ibex. Probably shaken up by our engine noise bouncing up against the mountain, a whole herd of wild goats ran over the almost vertical mountain side, hundreds of meters above sealevel. You have to look well, because they're pretty small compared to the size of the mountain. Unbelievable how they climb up and down so easily! 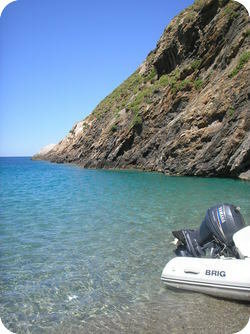 On the next island, Nisos Kira Panayia, we found 2 amazingly beautiful bays. 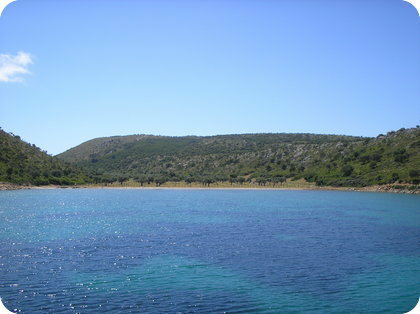 On the southern side, you'll find a bay with several 'fingers' in which you can anchor. 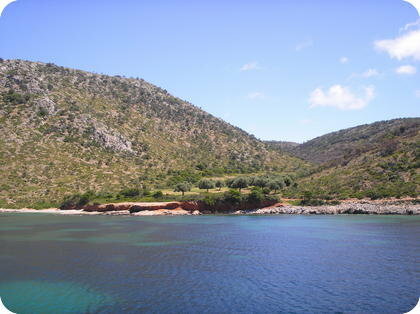 We choose the south-eastern one, where you'll see nice olive tree gardens and lots of goats walking around. The whole setting is very peaceful and I'm sure you come to rest here! But then, on the northern side, there's this anchorage named 'Planitis'. Oh My God!! What a beauty, heaven on Earth-style. Perfectly clear azure water, amazing surroundings. This one also has a few 'fingers' to choose from. The silence around you will astonish you. When we were here, there was no one else, which made it extra special, of course!